The first thing that attracted me to mirrorless cameras was the fact that they were so compatible with a huge range of lenses - provided they are combined with the right adapter. 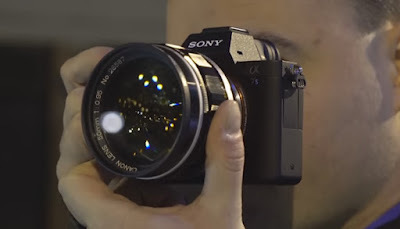 We were hugely excited at Park Cameras when we got the opportunity to combine a variety of cameras from the phenomenally popular Sony a7 range with the almost mythical Canon Dream Lens - aka the Canon 50mm 0.95 'TV' lens. This was a huge consideration when I eventually settled upon the Sony a7 II as my camera of choice - coupled with the furore over the ability of the a7 range as a whole and their full frame sensors (deservedly so). I am merely an amateur when it comes to photography, and previously had started dabbling with film photography after witnessing the joy derived from using a Yashica TLR one summer. At this point I learned all about medium format photography and had convinced myself that digital couldn't hold a candle to film photography. It was only after indulging in my new favourite hobby further that I learned the wonder of alternative lenses - prior to this I had been using a Sony DSLR with the subsequent kit lens. Epiphany ensued and I realised that if I build up a significant arsenal of lenses I can achieve the kind of thing I was experiencing with my Yashica-Mat and later Mamiya 645. My vast research pointed me in the direction of some incredibly cool lens and camera combinations, mainly the Sony a7 range being utilised with hundreds of different lenses - from all kinds of brands. I was astounded that I could buy glass from 50-odd years ago and mount it on my brand spanking Sony E-mount camera - and with a host of tools to assist with manual focussing. Basically film photography on steroids - albeit without the adrenaline rush of sending away for prints/scans (and subsequent disappointment at poor metering resulting in horrible pictures). On my path of photographic enlightenment I stumbled upon a few classic lenses - the holy grail of lenses you may say. First being the ‘Stanley Kubrick’ lens developed by Zeiss - the Planar 50mm f/0.7, dubbed the world’s fastest lens. Adopted by the auteur in his 1975 movie Barry Lyndon the speed allowed for many scenes to be shot by candlelight alone. Out of the 10 made, 6 were sold to Nasa, 3 to Kubrick and 1 kept by Carl Zeiss. My initial plan was to try and get hold of one of these so we could do some serious low light photography of our own with the Sony a7S II - one low light behemoth conjoined with another for some seriously good low light output. However, this was definite pie in the sky thinking - we couldn't get one. Low and behold we had a fantastic wooden spoon contender - the 50mm f/0.95 lens produced by Canon for the Canon 7 rangefinder in the 1960s - this wasn’t the holiest of grails, but it was certainly a grail and a lovely looking one at that. It was also far from a wooden spoon. Results weren't always sharp, but I'd blame the photographer here! The Dream Lens we had in our possession had been converted to M-mount which we affixed to a Metabones Leica M to Sony E-mount adapter - only the best for our lens which is valued at around £1500 in decent condition. For those unsure about lens conversion adapters, Metabones stand out as one of the few top-quality adapter manufacturers - which when throwing a £1500 lens on a £1200 camera is of vital importance. The first impressions of this lens was that it is most certainly dreamy - the Bokeh it produced when wide open was stunning. We had a brief play in store on the resolution packing Sony a7r II - and the results were divine. My ulterior motive came to fruition when we had been delivered the lens on a Friday - meaning I naturally HAD to take it home with me to ensure it wasn’t left lonely over the weekend. As mentioned previously, I had been au fait with film photography to a basic level - so when confronted with the manual focusing required with the lens, was more than happy to spend that extra time framing the shot. In fact, I rather enjoyed the added task as it harked back to my film days - albeit with the ability to preview my composition through the LCD screen and EVF on my a7 II. This was film photography for the modern ages - and I loved it! When using manual focus through a manual lens on one of the a7 you gain a real advantage by using focus peaking - which is a clever overlay highlighting which part of your picture is in focus.This is a particularly handy feature when taking portraits, line up the shot and focus until the peaking is apparent in the subject’s eyes, and voila! Also, with the Sony a7 II you have the option to select a peaking colour to appease your taste. The genuine delight I got from using this camera and lens combination truly vindicated my initial purchase, I was after a great everyday camera which has a great selection of original lenses (which is something it has taken a few years to build up), and one with the adaptability to provide something a bit different - just for fun. The Sony a7 II has delivered, and the dream lens was exactly as it has been described. It brought an extra element of enjoyment to my weekend’s shooting, and is on my list of dream equipment for the future. A dreamlike popping effect - no extra post-processes applied here! Whilst I got my fair share of fun from this lens, at Park Cameras my colleagues in our London store attached it to the Sony a7S II and took a walk around a Christmassy London to snap at night - making the most of the deadly low-light combination. Their experiences were captured on a Sony a7S II - to highlight just what an effective camera it is for video capture in low-light conditions (as well an all round fantastic camera). It's the DOF though. I shoot a lot on a f1.4 on full frame, and even there, you're gonna get one eye in focus, so how did you find it? You've got me thinking though, my nice Canon lenses on an A7?